In a large sauce pan, over medium heat, place butter, celery and onion. Stir and cook until vegetables are tender, about 8 minutes. Do not brown. Add parsley and pepper; mix. 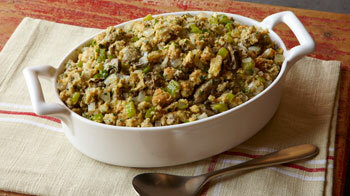 Stir in seasoned stuffing mix. Mix in oysters. If a moist dish is preferred, add oyster liquor or broth to make desired consistency. Spoon into a greased baking dish or casserole. Bake on middle rack of 325°F oven for about 40 minutes until oysters are cooked and internal temperature reaches 165°F.